The three stunning photographs at the top of our webpage are of Crafnant Lake - just above our village - which were taken by our guest - Michael Da Silva - who has kindly allowed us to use them. 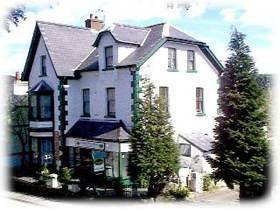 The four star Crafnant Guest House – built in the Victorian era – is centrally placed in this tranquil village of Trefriw, just 6 miles from Betws-y-Coed, in the heart of Snowdonia, an ideal central base to explore the Snowdonia National Park and Conwy Valley. Your hosts - Jan & Mike Bertenshaw provide bed & breakfast in a relaxing place to stay where you can rest assured of a warm welcome. 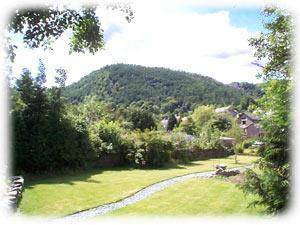 The photo below is taken from the bottom of our garden - where you can sit and enjoy the view. Our garden has previously won awards for being a haven for wildlife. There are a number of places in and around the village which serve excellent food - we have The Old Ship, Chandlers Brassiere, The Princes Arms & The Fairy Falls - all four places are just a stroll away. 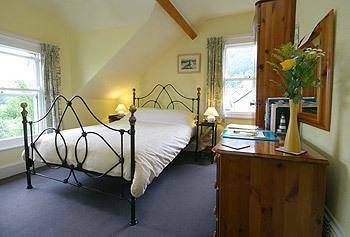 The Guest House is appointed to a very high standard and retains its period character, elegance and charm. 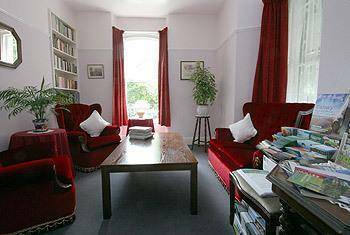 For our guests we have two lounges - a smaller one on the ground floor which houses a vast collection of books & tourism leaflets for the area. 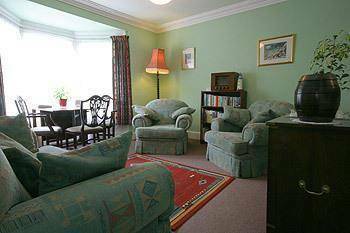 A larger lounge is on the first floor where guests can relax in comfort and read or play a board game or a jigsaw puzzle.